Step inside El Charro Hipster and you’ll find an eclectic mix of food, drinks and family. The restaurant and café’ opened at 1325 Grand Avenue in Phoenix in early September and is already making a name for itself with customers who live in the area. Co-owner Francisco Peralta says the thing you’ll love most about the restaurant is how you’ll feel when you first walk inside. “One of the things I always say is we don’t know the neighborhood, but we know the neighbors. We tell them that we are not trying to copy anything and we are coming up with our own ideas. So everything that you see is our design- the food, the drinks, the music is our design. We have been traveling around the world and we’re so happy to bring it here to Phoenix,” said Peralta. Francisco opened the restaurant with his wife Rebeca and their daughter Karen. Both women say El Charro Hipster has already become a labor of love. “For me I love that I get to work with my family. “We worked very hard to come up with the recipes. A lot of trial and error. We have Mexican, Spanish and Italian dishes. It’s a very eclectic mix. We are trying to do something different,” said Rebeca Peralta. “It is a dream come true. I’ve always wanted to be a business woman. I’ve always been an only child so 12-14-hour day with your parents is great,” said Karen Peralta. With a name like El Charro Hipster we had to ask: How the name came about? “With the menu and the mixes we are trying to create something new and fun. The Hipster part of El Charro Hipster is something that is post-modern but also respecting the roots of El Charro (Classic Cowboy Style),” said Francisco Peralta. “The Mexican part is my culture…so I wanted that to be a part of the name. I’m also a millennial so I wanted the name to be something different. So what’s something that people can remember: Hipster. So it’s a play on words. It’s a modern twist on the Mexican culture,” said 22 year old Karen Peralta. The inside of El Charro Hipster is an artist’s dream. You’ll find chairs painted with unique designs, bikes hanging on the walls and a comfortable bar where you can belly up for a beer or your favorite latte’. “Art is one of my passions and I’m a music composer and I paint. So I invited all the local artists in the community to paint the chairs. I ran a contest so all the chairs are a piece of every artist in the community. Everyday we have something new, including a statement on the chalk board. That is art also. We also have a black and white movie that plays,” said Francisco Peralta. “It’s simply a place where people can come and be comfortable like it’s their home. I see people coming in for 3 or 4 hours studying. That makes me feel great. Seeing my customers happy is what keeps me going. The music we want it to be at the perfect level. Our motto is “Bringing Back The Art of Conversation”. We feel like we’re doing a great job of that and it’s helping enrich the lives of people,” said Karen Peralta. 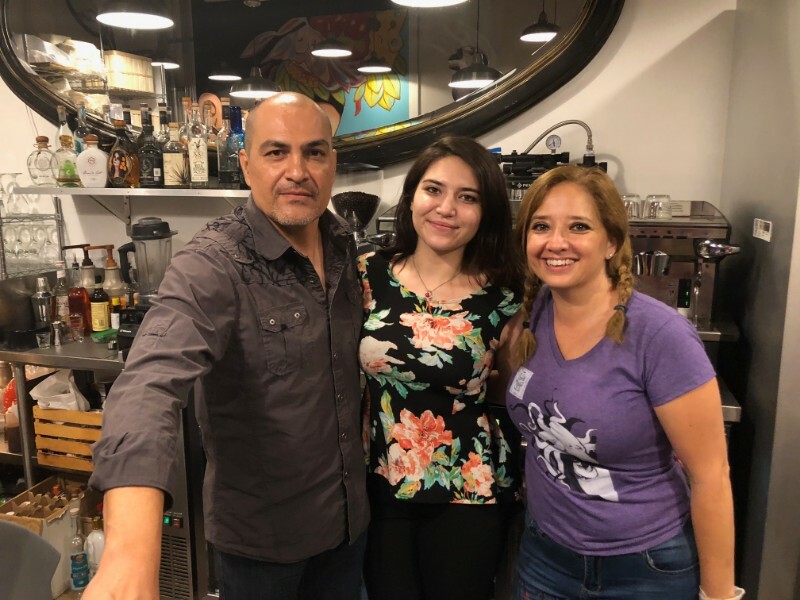 As for the future of El Charro Hipster the Peralta family hopes they will continue to grow in their new spot and one day expand across the Phoenix Metro. “You have to have a great foundation. We believe 100 percent in a business plan. Now you have a lot of competition. In Silicon Valley they call it pivoting. So we really listen to the clients. So every time there’s something a little new. The customers are really happy with what’s we’re doing so far. This is a franchise system. We’re creating a system that can be duplicated. This area on six point in the Grand Avenue area is a unique area and is really revamping this area in Phoenix. So we are looking forward to the future. It’s a different kind of place and I think it can ultimately be a great franchise, “ said Peralta.